The cliffs of the Ponta da Piedade headland is one of the finest natural features of the Algarve. This dramatic limestone coastline is formed of sea pillars, fragile rock arches and hidden grottos, all of which have been chiselled-out by savage winter storms. 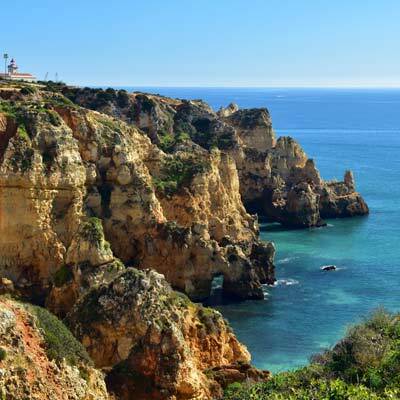 The Ponta da Piedade is a bleak and windswept headland, and the beauty of the region is only discovered on descending the cliffs, where the exposed cliffs reveal their golden colour, and the turquoise sea waters lap precariously balanced rock formations. The headland can only be described as stunning. 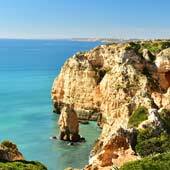 For your visit to the Ponta da Piedade, there are two methods to explore the headland; either from the landside via coastline footpaths, or from the sea, as part of a boat tour. These boat tours employ former fishing boats, and are able to navigate the fascinating cliff structures, while for the more adventurous visitor there are kayak or Stand Up Paddleboard tours. 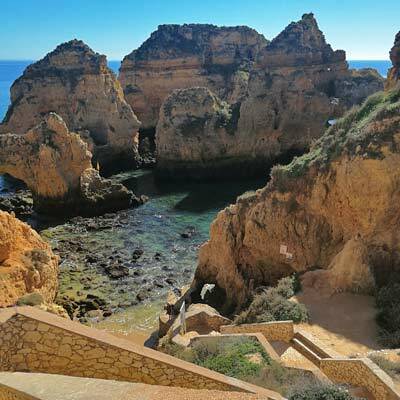 A visit to the Ponta da Piedade on the landside is as equally enjoyable, with footpaths navigating the cliff tops, a set of stairs leading to the most picturesque cove, and a scenic boardwalk, which provides wonderful views over the coastline. 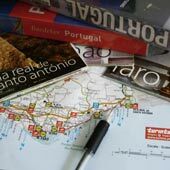 This article will provide a tourist guide to the Ponta da Piedade, and includes details of the boat tours, the hiking routes and useful tourist information. 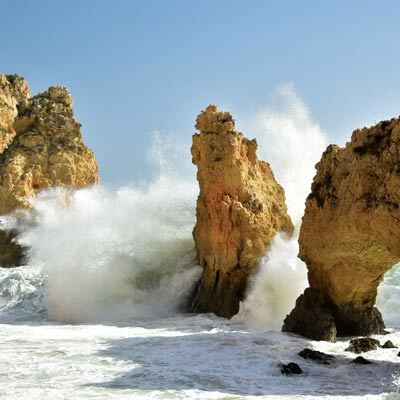 The Ponta da Piedade, which translates to Piety Point, is situated 3km to the south of Lagos (GPS: 37.080990, -8.669636). 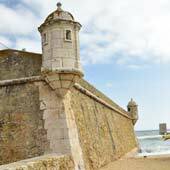 It is an exposed and barren headland, where the cliffs and coastline are the main attraction. 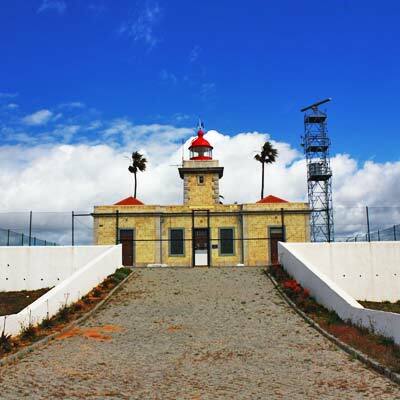 At the headland, there is a lighthouse, a car park (no overnight camping), a couple of gift shops and the Sol Nascente restaurant, where drinks and referments can be purchased. The best section of cliffs are on the eastern side (left of the lighthouse, just behind the gift stalls), and there is a staircase leading to the base of this beautiful cove. 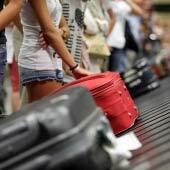 ....but the view is worth the effort! The cliff-top boardwalk begins at the car park (GPS: 37.080861, -8.669611) and continues along the coastline to the Cascade Wellness Resort, (GPS 37.084932, -8.678592), but unfortunately, it does not continue to the Porto de Mos Beach. 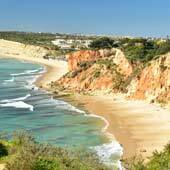 Insider Tip: The best restaurant of the Ponta da Piedade area, is the “O Camilo” (GPS: 37.086771, -8.669647) close to the Praia do Camilo. This restaurant specialises in seafood while offering wonderful views over the beautiful coastline – a great place for a romantic meal..
To reach the Ponta da Piedade you will either need to drive, walk or catch a taxi (€5-6 from central Lagos), as there is no public transport. 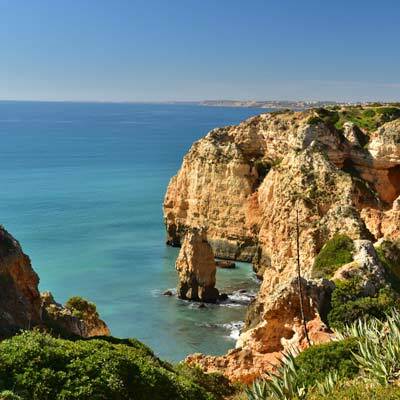 The direct walk from central Lagos takes around 30 minutes, but there is a coastal path, which passes the Praia Dona Ana beach and Praia do Camilo. 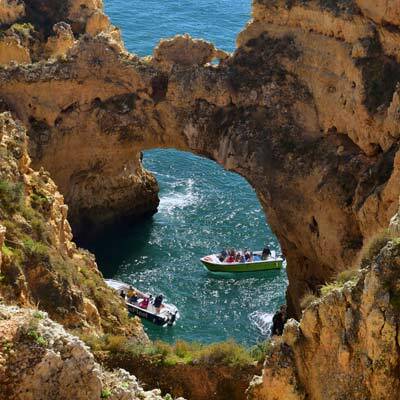 The most memorable way to experience the Ponta da Piedade is via a small boat tour, which are able to weave between the rock structures. 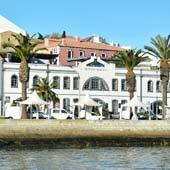 These tours depart from the marina in Lagos and typically costs between €20 for a 75-minute tour or €25 for a 120-minute tour. The actual price reflects the "novelty" of the boat or extras included in the tour, such as snorkelling, swim or Stand up Paddle. For visitors who walk or drive to the Ponta da Piedade, there are small boat tours, which depart from the base of the cliffs and provide shorter length tours. 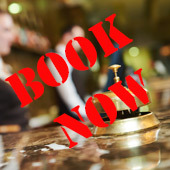 For the last five years we have worked with GetYourGuide.com, and below are a selection of the better tours and trips that they provide for Lagos. For the more adventurous there are kayak and Stand Up Paddleboard (SUP) guided tours. These have the advantage of exploring more of the coastline in a friendly small group setting, but have the safety and knowledge of an experienced guide. Depending on the tour there can be the opportunity to snorkel or swim in the clear sea waters. 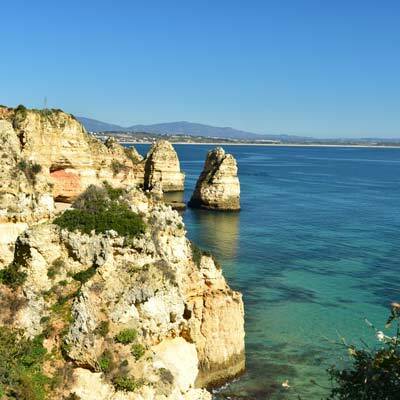 Both types of tour depart from Batata beach in Lagos, and paddle along the 2km coastline to the Ponta da Piedade. These tours last around 2.5 hours, kayak tours cost €30 while the SUP tours are slightly more expensive at €35. 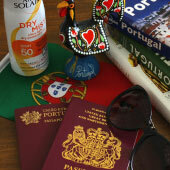 Advice: For all tours always remember to wear a strong sun cream as the summer sun is very intense. During the low or off season always check weather conditions as the waves and winds can be strong. 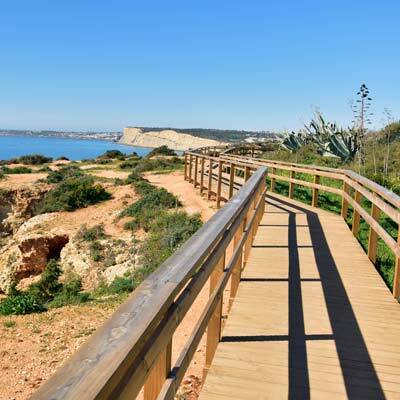 The Ponta da Piedade boardwalk follows the western side of the coastline, and extends along the cliffs above the Praia do Barranco do Martinho to the Praia Canavial beach (there is no access to the beach). The series of walkways are ideal for people with limited mobility as there are no steps and are good for children as they are safely away from the edge of the cliffs. Along the route are four viewpoints and shaded seating areas. 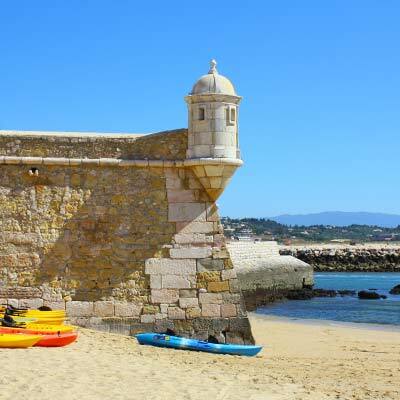 There is a footpath which continues to the large beach of Praia de Porto de Mós (37.085794, -8.687772), but it does not follow the coastline and heads inland through the residential district of Porto de Mós. 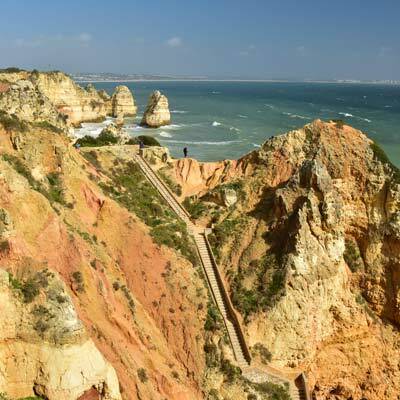 Important warning: The Ponta da Piedade are unstable cliffs, with sheer drops and uneven pathways. Every year carless tourists slip to their death while trying to take the perfect Instagram photo or selfie….. Many visitors simply visit the Ponta da Piedade for the stunning cliffs, but there is a diverse selection of wildlife in the region. During the spring months, the cliffs are alive with nesting herons and flowers blossom from January until late spring with an abundance of wild figs. The Ponta da Piedade headland is considered as the best locations in the western Algarve to view the sunset. The sunsets here are beautiful, with the sun dropping behind the high cliffs of Sagres to the west and the massive expanse of the ocean. On clear days, there are good views along the coastline to Carvoeiro.